The Philadelphia Eagles had a rough time in their opening game against the Green Bay Packers, as they lost 27-20. Not only did they lose, but they had several injuries to key players, including Leonard Weaver, Jamaal Jackson, Stewart Bradley, and quarterback Kevin Kolb, who was knocked out of the game with a concussion. Kolb had a poor game in his debut as starting quarterback, as he threw for only 24 yards. 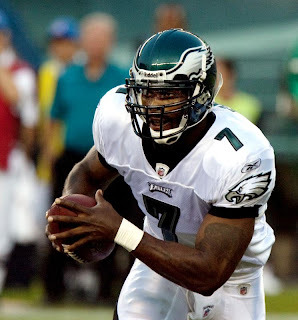 The one bright spot for the Eagles was the play of back up quarterback Michael Vick, who led the Eagles to 17 second half points. Philadelphia sports talk radio will be buzzing this week as to whether there is a quarterback controversy. However, it’s highly unlikely that Eagles coach Andy Reid will give up this quickly on Kolb, who has been designated as Donovan McNabb’s successor. Vick looked great, but you need to give Kolb a chance, and you can’t judge him by one bad half against a really good defense. Who do you think should be the Eagles’ starting quarterback, Kolb or Vick? Please comment below. One Response to Philadelphia Eagles Quarterback Controversy? Can you say Kafka? I said 2 months ago that he will be our starting QB before the season is over. I hate Vick for what he did to animals. I can’t stand people who do that and will not forgive him. He did look good yesterday, but he is not a high quality QB and never will be. He has a right to play, I just don’t want him on my team. As far as Kolb is concerned-do you think the Inquirer did him a disservice by running that week long love fest series when he is just starting out? They did the same thing with Bobby Hoying and both Detmers. How did that work out? I think that’s a jinx, and puts too much pressure on an inexperienced player. Would you say his family looked just a little disappointed?